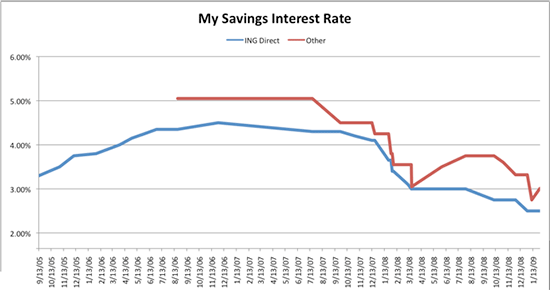 This is a historical graph of the interest rate on my savings account since I opened my ING Direct account on Sept. 13th, 2005 to today. I have since “day-traded” my savings accounts between ING, HSBC, e*Trade, and Capital One. The interest rates vary from a peak of 5.05% to a low of 2.5%. My rate was 3.75% as recently as Nov. 2008. Today I’m earning 3.01% with e*Trade. A graph of the interest rate of my savings accounts.